SCS Software's blog: Steam today! 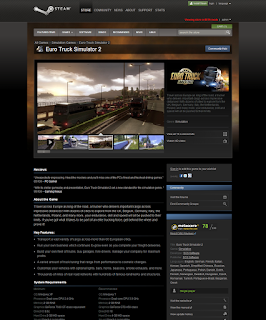 Product Keys (also known as CD-Keys) issued for ETS2 should allow for activating the game on Steam as well. No key-gen trickery will work though - this is a topic which will be addressed by the next non-Steam patch, too. The first version of the game to appear on Steam will be equivalent to 1.2.5 which has been out there for a long time. We are working on several improvements and new features for the game, but they will only appear in the next update - When It's Done. let me get this straight, with my key I bought on the website of SCS can I activate my game on steam? So far, it's not working for me. Has anyone had it work yet? I just activated my ET2 on Steam without any issues. After two minutes I didn't see game in my library > all games so I simply logged out and back in and the game was there. It's downloading via Steam now. :) Thank you SCS! So we can't use our cd keys to activate on Steam yet? We have to wait for next patch? nice job guys and keep doing a great job. We have submitted our entire key database to Valve, so any _valid_ key you have bought either from us or our partners, be it a CD-key or key received online, is eligible to activate the game on Steam. Okay well mine isn't working yet so guess i will wait for them to update their servers. Excellent news, very long waited but has not waited, 3 days ago has bought a disk. Very much I hope that this key will approach soon to Steam. And if there is no that for certain I shall buy game still and in Steam. Cool! Keep up the good work. So I have a copy from origin and I can now also activate it on steam? Nice! This hopefully will be usefull with DLC that hopefully also gets released on Steam. Congratulations, great job SCS-Team. And now we wait for the new patch, also??? Awesome news! Congratulations SCS Software team. Does my Activation key still work if I go to the "Activate a Product on steam" tab in +Add game? The Dacia Sandero will have Electronic Brake Force Distribution! I remember only Dacia 1310, it was surprisingly good car in 80's, but still, how is Dacia related to trucks? James May reference? You sir are epic! We need more Trucks in the Game. Tandem is that word. And you don't need it, you can live without it. SCS, on the other hand, needs to be on Steam, it's the question of their business. I don't care about Steam too, but it's obvious how important is for game developer to be on Steam. Give you soap, go and wash your mouth. The game is for everyone, not just you. That's why a gaming platform to be extended. Do you understand??? To an extent, I agree with the variations of trucks (Even if they are a DLC with older ones such as the TGA you suggest). However, Tandem's aren't completely necessary (although the present a different challenge, and should be more like the rigid vehicle's to drive). Gigaliners I have never seen (I'm Scottish), so I do doubt this would be brought into the game. Never say never though..
Also, whilst some (like yourself) dislike Steam, there are many who only buy their games through it. So for SCS and ETS2 to be on Steam, it opens up a larger fanbase than that which originally exists, giving the company some much needed funds. Yeah-yeah, I'm dying to see you trying to fit a gigaliner or a tandem into those 1-lane turns approaching to the Channel Tunnel. Here in Sweden gigaliners are very common, they almost dominate the truck traffic! So I'm eagerly awaiting them! Well Sweden is one of exceptions. But that means they first must make a Scandinavia extension. :-D These beasts are also allowed in Netherlands and I heard on few highways in Germany too (don't know if that's true), but that's all. So right now, it does not make sense to put them into the game. Moreover, imagine how you could drive them to any existing dock in the game. There should be special docks with good access where you have enough place for maneuvering. Gigaliners are way to go if you ask me. They're dominating finnish truck traffic. I feel like driving tracktors or something with those "normal trucks". It would be perfect way to add some challenge to game. I have been truck driver in finland six years. Thanks guys! I LOVE SCS CREW! Oh yeah, THAT workshop. Since I'm not Steam user, I didn't realized he talking about this. Well nothing for me, but of course, others could appreciate it. Thanks for explanation, anyway. Workshop would be superb for a moddable game like this, but I bet it takes a lot of work to implement. But one can hope! Or at least for upcoming games. Why is it that ets-2 in a new city, I did it my company rewrote the files inital_save the company.sii, city.sii files and when I want to bring the goods to the freeze game. Why? Guys, I wonder if my key will work on steam, I bought my game on the website of SCS on launch day. will it work? It is within the requirements that were said in this blog post? So what kind of keys will work? Of course YES. Don't worry, he's joking. The only one condition is your key is not blacklisted. If you didn't shared it, it will work. Hello everyone. I was wondering if i should write this, or not.
" We are working on several improvements and new features for the game, but they will only appear in the next update - When It's Done." How is this possible?? You guys say you will release the update when it´s done?? Is this a joke? is this an answer or comment from a professional company?? you don´t define targets or goals to achieve? release dates?? Keep doing the great job, but think twice before post some comments, this time you didn´t stay well in the picture. You wondered correctly - you shouldn't have written this. When it's done is a perfectly sensible answer. SCS are a small developer, not some massive corporation like EA. You criticize them for not providing a date, but then you fail yourself to provide a reason. In my opinion only joke here is your comment. Why should they provide a date when they can't know when it's ready? Too soon and people will cry because they need to delay it. Too late and people will be upset because it takes so long. Not good for small developers (actually I don't think it's good for any developer) to create unneeded pressure by setting this kind of goals. Better to take your time with it and deliver something good when it's ready to be delivered. People will wait. We waited many years for ETS2, waiting for an update for it should not be even discussed like this. @Joao Pereira: I can think on two options: You either have no idea about software development, or you do and you're the boss of some poor souls. "When it's done" it's something you'll hear around more and more, even from big and serious companies. As a developer, I know that some things take some time. Sometimes that time can be calculated, lets say "we will release it next friday". Some times it CAN'T be calculated. A company has some options: Not offer a blog or anything to comunicate, and just release patches. Offer a blog and answer the questions like "we're working on it, we don't have a date" (which basically means "when it's done"), or always post a date and then keep delaying one week... another week... etc... until it works, which also means "when it's done". Even if you say a date, and even if you TRY with all your strenght to release at that date, there aren't more than 24 hours in a day, so even if the developers worked 20 hours, sleeping 3 hours and 1 more for eat and go to the WC.. it couldn't be done either. So "when it's done" it's a pretty good answer. They can still work hard, they are not fixed or compromised with anyone to any date, and they release a product when it's safe to do it, and when it works. Yeah-yeah, obviously Blizzard and Valve are also just jokes since they've posted When It's Done release dates for their major titles. I would rather they just released it when it is properly ready than be like someone like EA who rush out bugged games then often cannot be assed to even patch them properly as they are too bussy on the next money maker . "When It's Done" is usual saying, especially in software development. Read it as: "Even we can't estimate when we release it. Please don't ask when, we would like to answer you, but we don't know." It's professional answer, because if you know your estimate could be delayed, the best thing you can do is to not promise anything. @ Joao Pereira : Have you ever heard of Rockstar that do GTA or The developers of Starcraft II or a lot of other developers that say that it will be available when its done. Just because you dont like them saying that it will be available when its done doesnt mean its unprofessional. I honestly wonder if some people who post on here only visit this page all the time because some of you dont seem to have a clue whats going on with other games developers. You call unprofessional to something you dont like SCS says but its been said by big developers too. Also when they gave a release date the last few times so many people went up in arms when the release date was pushed back so they were right to say when its done instead of giving a date and then have to push back that date because of bugs then have some impatient cry babies whinge because it was delayed. SCS I heared you were talking with the developers of ets2mp.com. Is this true?? Can we expect Multiplayer soon?? there is group who plan MP publish... maybe 2nd part of 2013.. I know. They told me that they had talks with SCS. Hopefully, this should add much more of an audience into the game, and a lot of needed funds into your account. Congratulations Pavel and all at SCS. Great stuff! 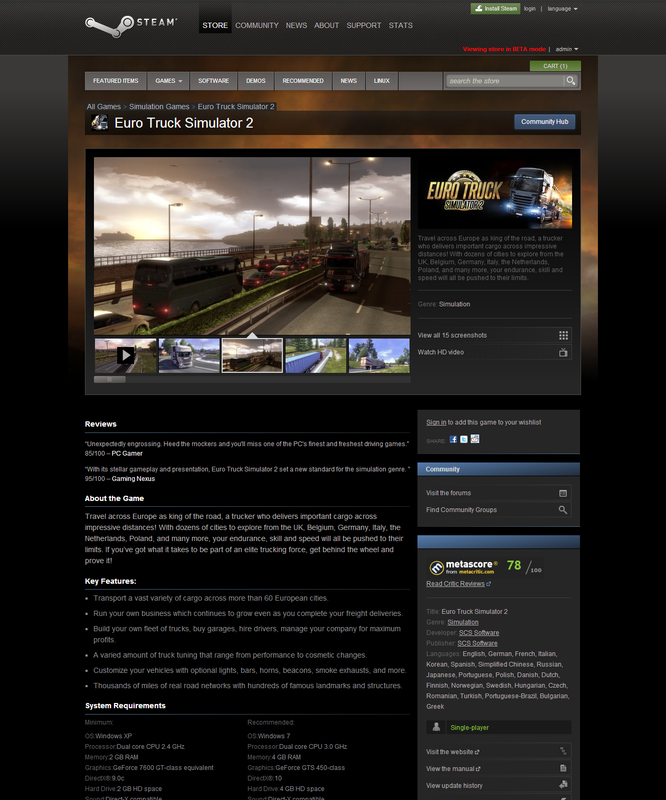 Hopefully the download count of ETS2 will increse rapidly thanks to this! :) Good luck! and .. I register steam ? How will our saves work with the steam version? Anyone able to redeem their keys on Steam yet? Gonna buy, for sure! Now just sayin... I really miss the 18 Wheels of Steel Series! Miss the honks when another trucker passes buy, miss the police and the adrenaline of having to disrespect some driving rules to get the job done, miss the radio chatter, and most, miss the BIG trucks!!! Hope the next will bring all those back! Nothing showing on Steam yet ... at least, not on my computer!! Sorry to hear that, as well as from other guys. Wish you it'll be fixed soon. Same here, cannot activate retail version. My key dont work What's wrong???? Wow. $12.99 - 10%. I'm really sorry you had to settle for this little. :( I was expecting to pay at least $20. Exactly, €27. Maybe he does not mean USD? There are other dollars in the world. Or maybe isn't there some discount for good customers? Or even maybe he's just joking. This seems to be a common problem ... best let SCS look into it, before we Spam the Boards to death! You will add Steam achievements in the game later? SCS Software owes you nothing. You got to play the ETS2 demo for free, and the contents of the game were clearly advertised, so if you bought the game, then you got what you payed for... a great game at a very reasonable price. (if you pirated it, then shut up and get out of here). If SCS Software offers to provide free enhancements and upgrades to the game, then be grateful and shut up and wait patiently for it. If you buy a new house, do you go back to the seller after 3 months and demand they add an extra bedroom because your needs/wants/expectations have changed? No... you bought it 'as is'... end of story. If SCS Software offers additional content for the game as DLC and charges a reasonable fee, then you decide if it's good value and then buy it... or don't. You don't expect someone to add a hot-tub or pool to your house free of charge, why would you expect your game to be expanded free of charge? What does any of that have to do with the retail keys not (yet) working for Steam activation as advertised? Yeah, he's right and +1 for him, but it would fit much more under other blog posts. Not working keys is the topic of the day. It was the post by Joao Pereira that set me off, but I thought if I posted it as a 'new topic' it would get more notice. (rather than replying to Joao Pereira and it getting lost in all the previous discussion). OK, understand. :-) You know what's great? Those brats will do not read your message anyway. And if, they will not think about words. I've tried to explain them things like these like million times. If even half of them would read it and think about it, there will be much better atmosphere on this blog. But listening to others is not their style. The way you write your ideas, i believe that you must be another Hitler or some kind of Saddam Hussein. Do you think you are the biggest brain in the planet? Respect others oppinions the way i respect the others comments. And be a man to identify your self, don´t hide in the back of an anonymous post. Congratulations SCS !!! Just one problem how come the physical copy is cheaper on amazon.co.uk and the digital is more expensive on steam, surely producing and packaging plastic discs and cases should cost more... anyway, if I were to buy the Download version from Game.co.uk would I receive a key which I could then use to redeem on steam or is it only a download?, the product page @game doesn't mention much about the game. Physical copies are almost always cheaper than digital copies (not counting sales, etc, of course). Especially directly from Steam. The downside with the physical copy, is that it probably requires the DVD at all times during play. At least, this is how it was with the first ETS. It doesn't, you just need the key that's inside. I was using the demo and then just upgraded from that using the CD key and I am still yet to use the disc. I am going to assume that that means that If I buy the download version from game.co.uk it will come with some sort of serial code/key which I could use to upgrade the demo OR (if they get it working) Activate it on steam. Please scs.. finally optimize the ETS 2 graphics properly! Guys my GMG key just worked right now, try it. This is the best! Activated my key that I bought at launch from SCS's website! Amazing! I want to move Euro Truck Simulator 2 to Steam, I bought the game in the digital distribution activation key was sent to my mail. Unfortunately, my brother cleaned out my inbox, I installed the game without Steam shortly after its release. I can read the license key of the installed version and move it to steam? all things work like before steam! do old save games work?? also, does cloud update your stuff via steam so u can continue ur progress on different PCs ?